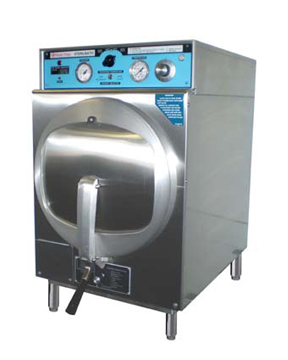 Will be a Market Forge Electric Automatic Steam Pressure Sterilmatic Sterilizer (Autoclave). The Sterilmatic is dependable, and ideally suited for laboratories, veterinary clinics, processing plants and more. The sterilizer door will be self-sealing type which cannot be opened until steam pressure is completely exhausted. Door will be 12 gauge stainless steel, removable for cleaning without tools. Door gasket will be one-piece molded, replaceable without tools or cement. Sterilizing cycle will be fully automatic, time-controlled and have a built-in temperature control which provides 250°F (121°C). Model STM-EL has the additional feature of an adjustable temperature control that can be set anywhere from 230°-250°F (110°- 121°C) range. All operating controls will be located at the top, front of the Sterilizer. Pressure will be automatically and quickly exhausted and power supply shut off at termination of cycle. Slow exhaust may be selected for sterilizing liquids.